The Triumph T50 is one of the biggest and well built gun safes from Champion Safe. The Triumph Series is one step below the top of the line Crown Series. There are 6 different Triumph models with the T50 being somewhat in the middle as far as gun capacity. The T50 is a newly introduced model in 2011. 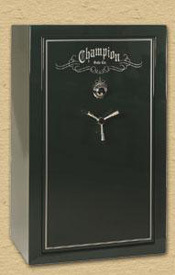 In addition to adding the T50 in 2011, the Champion Safes also upgraded the fire rating for the entire Series. All of the Triumph’s have a 2 hour rating for 1,500° F. Champion also reconfigured some of the storage capacity of the series. Steel: The T50 has 10 gauge steel. In a perfect world without monetary boundaries, this is the minimum gauge steel I like to see on a gun safe. Locking Bolts: There are 18 bolts spread around all four door sides. Each bolt is 1.5″ thick. Lock Plate: Champion is the only residential safe gun safe manufacturer to imbed industrial diamonds in its lock plate. The company also uses tungsten steel to make the plate, which is significantly harder than other lock plates you will find. Fire Rating: In 2011, the fire rating on this safe series was raised to 2 hours. If you buy a Triumph Series safe, make sure you get the 2011 model year. Height: The safe is 72 inches high. You shouldn’t have any problem fitting your collection in this safe. Dealer Network: It is very difficult to find competitive pricing on these safes, because Champion only uses a special dealer network to control the sales process. While this is a legitimate business practice, it certainly does not make it easy for you, the consumer, to get the best price. Fire Rating: As stated in other reviews, Champion Safe performs their own in-house fire ratings. They call it the “Phoenix Fire Rating” and they create a class system to make it sound so very official. I normally do not (and still don’t) like in-house ratings. But, I really like the way Champion describes their testing procedure and why certain aspects of their testing are important. Thus, while I wish they used a neutral party to test the fire ratings of the safe, I won’t penalize them too much in this review. You get eight different color options. Five glossy color choices and three textured finish colors. Champion saves the two tone colors for the Crown Series. Too bad! I like this safe. For approximately $2,200-$2,400 you get a very good safe.